Row 1: 1sc into the second chain from hook, 1sc in each chain across. Row 5: chain 1, turn, 1sc in each of next 10 stitches, 1 bobble stitch into the next stitch, 1sc in each of next 2 stitches, 1bobble stitch into the next stitch, 1sc in each of last 10 stitches. Row 7: chain 1, turn, 1sc in each of next 9 stitches, 1bobble stitch into the next stitch, 1sc in each of next 5 stitches, 1bobble stitch into the next stitch, 1sc in each of last 9 stitches. Row 9: chain 1, turn, 1sc in each of next 8 stitches, 1bobble stitch into the next stitch, 1sc in each of next 7 stitches, 1bobble stitch into the next stitch, 1sc in each of last 8 stitches. Row 15: chain 1, turn, 1sc in each of next 8 stitches, 1bobble stitch into the next stitch, 1sc in each of next 3 stitches, 1bobble stitch into the next stitch, 1sc into the next 3 stitches, 1bobble stitch into the next stitch, 1sc in each of last 8 stitches. Row 17: chain 1, turn, 1sc in each of next 10 stitches, 1bobble stitch into the next stitch, 1sc in each of next 3 stitches, 1bobble stitch into the next stitch, 1sc in each of last 10 stitches. Sew a fabric or a felt inside. Place a plastic canvas piece in the middle. Add a magnetic button. Round 1: Work 1sc around and join the sides with the bag. Round 2: 1 reverse sc around. finish your work. 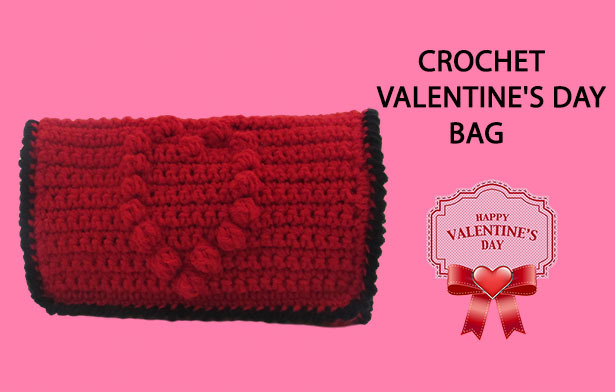 You can watch our video tutorial witch shows you how to crochet the Valentine's Day Bag step by step.